At a microscopic level, organisms are ruled by interacting systems of biomolecules. Historically, scientists painstakingly elucidated chains of molecular events using experiments that reveal individual interactions, although they recognized that members of different pathways frequently interact. In recent years, researchers have built richer, interconnected networks to mathematically summarize their knowledge of these interactions. This systems biology enterprise, largely stimulated by high-throughput tools like microarrays that measure mRNA levels as an indicator of gene expression, is a vital and increasingly important activity in both basic biology and in medicine. A nagging concern, however, is how accurately these networks represent the biology. For complex systems like biological networks, there are practical limits on how well even massive amounts of data can uniquely define the underlying structure and yield useful predictions of measurable events. Indeed, although its advocates call this process "reverse engineering," the topology and the detailed molecular interactions of the "inferred" networks will likely never be known with precision. This volume captures the ongoing process to assess the ability of scientists—and their computer servants—to infer networks from experimental data, by comparing their predictions to "gold-standard" networks whose structure is thought to be known. 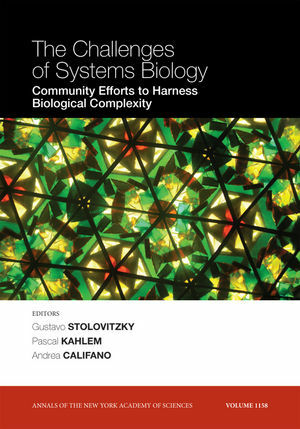 Gustavo Stolovitzky is the editor of The Challenges of Systems Biology: Community Efforts to Harness Biological Complexity, Volume 1158, published by Wiley. Pascal Kahlem is the editor of The Challenges of Systems Biology: Community Efforts to Harness Biological Complexity, Volume 1158, published by Wiley.